Please Take Our Scientific Research Survey to Understand Influence in Order to Transform the Legal System! A year ago, I announced my new effort to research, publish, educate, and update the legal system in the United States and, hopefully, around the world. The law still operates using a “rational agent” model, saying essentially that once you reach the age of majority, you make rational choices. However, in the past fifty years especially, there has been a huge amount of research to show that humans are rationalizing but are not rational. For example, the Nobel Prize in Behavioral Economics was awarded to psychologist Daniel Kahneman for his research summarized in his book, Thinking, Fast and Slow. In it, he details how people use unconscious heuristics when they make most decisions. However, the research, which was so important for business and economics, has not been applied in a systematic way to the legal system. It does not yet have a measure to systematically calibrate the use of undue influence from an agent or group over an individual. 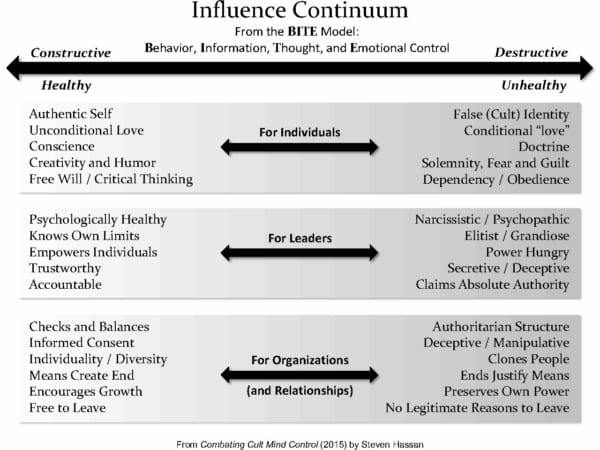 Under the mentorship of Dr. Michael Commons, I formed Freedom From Undue Influence, a division of the not-for-profit Dare Association, Inc., the acting ancillary research facility to the Program in Psychiatry and the Law of Harvard Medical School. Our purpose is to conduct and publish research on undue influence in order to develop the scientific knowledge needed to update legal and social policies to reflect the current understanding of bioethics and to help diverse individuals and groups affected by undue influence. We intend to develop curricula and provide training to assist individuals, organizations, and governments in combating undue influence. We seek to use the latest knowledge in social psychology, neuroscience, human development, and related issues of identity to increase the understanding of healthy and ethical influence as well as unethical influence. Last year, I began a doctoral program in the Organizational and Change (ODC) Ph.D. program, through Fielding’s School of Leadership Studies and I am doing my dissertation research to help develop a valid scientific instrument to evaluate undue influence. Call to Action: Please Help! This survey begins gathering important raw data. This is where I need your assistance. I need participants to take this anonymous study, so we can develop the instrument. Please give feedback on what you think was most important, as well as, ways to improve it. Please follow the study link to participate. IMPORTANT, you need not have been in a high control group to take the study and help contribute. If you have NOT been in a controlling group or relationship, simply answer in the negative. I need everyone’s assistance. If you have been in multiple groups, please answer with one group in mind and indicate that group. If you were heavily involved in two different groups, if you wish, you may take the study a second time for that group. If you know of other people or other organizations with whom you can share the survey link, please do so. I will be very grateful. We need a minimum of 100 respondents to make it statistically significant but it would be great to get a far bigger collection of data. Please remember I am looking for feedback on how to improve the instrument. If you have a research background, please give me your best advice. Again, I thank you for your help! (Please be aware that there are many questions and it may take up to 20-25 minutes to complete. You do not have to complete the survey at once. Leave the computer on and the browser window open and you can finish the survey later.) Here is the link again that was at the beginning of this blog.